The Wildstorm has been an intriguing reimagining of the Wildstorm universe, with writer Warren Ellis and artist Jon Davis-Hunt slowly rebuilding characters and concepts so that they come across as plausible in a world that is much more similar to reality than the main DC Comics universe. As the main series steadily expands, the first Wildstorm spin-off has arrived to zero in one of its central characters: Michael Cray, an assassin whose brain is drastically changing at a cellular level. Titling this series Michael Cray instead of Deathblow (Cray’s codename in the old Wildstorm universe) immediately indicates a more personal, grounded perspective for this story compared to previous Deathblow comics, and Michael Cray writer Bryan Hill and artist N. Steven Harris are keeping in line with the tone set by Ellis and Davis-Hunt to craft a tense action thriller with superhero sci-fi elements. There’s one big twist in Michael Cray that should ideally bring the eyes of DC fans over to the series: Michael’s targets are villainous versions of DC heavy hitters. The book’s first two issues have Michael facing off against Oliver Queen, who dresses up in green body armor and hunts down veterans with a bow and arrow, and the next two will pit Michael against corrupt cop Barry Allen. Folding DC characters into a new Wildstorm universe makes Michael Cray feel like an offshoot of Warren Ellis’ Wildstorm series Planetary, which had two crossovers with established DC heroes and often featured analogs of those established characters. It also feels like a response to DC incorporating the Wildstorm characters into its main superhero line with the New 52, showing the potential of taking these heroes out of their heightened world to bring them down to earth. 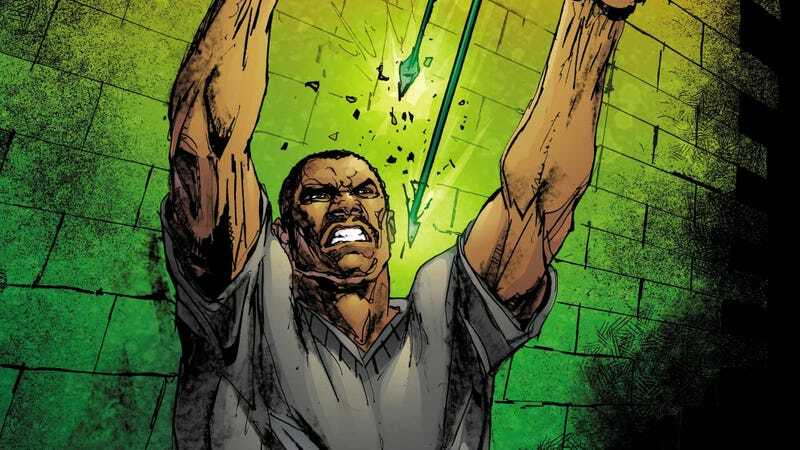 This exclusive preview of next week’s Michael Cray #2 has the titular character assembling a team that will help him wipe out the threat of Oliver Queen. Harris and inker Dexter Vines create artwork that looks a lot like ChrisCross, one of the great underutilized superhero artists, with clean lines that have weight but also a graceful flow. Colorist Dearbhla Kelly makes strong palette choices to differentiate the steampunk virtual reality from the office environment outside the VR masks, and her light rendering keeps the strength of the linework at the forefront.The action in this preview is just a taste of what this creative team delivers in this issue, and the brutality intensifies once Cray goes head-to-head with Oliver Queen.